An Avalon Waterways river cruise ship. 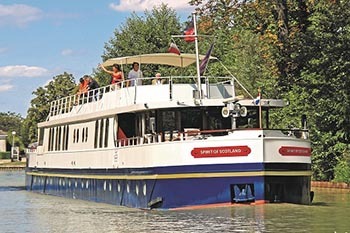 River cruising is a whole different animal from its big brother named Carnival, or Celebrity. These cruises are taken on mega-ships, that have amenities you just would not believe. How about ice skating or a rock climbing wall as you cruise the Eastern Caribbean? Nope, when you choose to river cruise, it’s more about the destination. That’s because even though river cruise ships are very, very long, and offer superb accommodations in luxurious cabins, great dining with plenty of fine wine and a wine steward, here the point is not as much the cruise as…the view. River cruises down the Danube take cruisers past hundreds of small towns and huge cities like Sofia, Bularia, and Targu, Romania. These cities have been lived in for thousands of years, their history dwarfs anything you might glimpse at during a Caribbean cruise. Not only will you see old men tending to their gardens on the riverbanks, you’ll see fishermen casting their nets, and many smaller boats plying the same waters right beside you. When you take a river cruise, it’s a bit like taking a trip on a train. The river goes past so many people’s back yards, you get to see behind the houses and see kids playing, animals grazing, and life being lived as you float by. The ships used by large river cruise lines are tremendous….it’s not a small barge as you might see during a France river cruise, no, it’s more like a very, very long freight train, but with no wheels. Everything including the fresh food can be easily loaded in each port, so they can offer delicious cuisine and keep it local too. 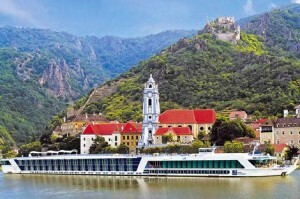 Many different lines offer river cruises throughout almost all of Europe’s large rivers including the Rhine, the Seine, the Danube and the Rhone river. You can vacation in many countries at one time as you watch them glide by, and you don’t need to worry about checking in with border patrols since cruisers are allowed to traverse international borders within the European Union. Here are just a few of one cruise line’s offerings this summer. It starts in Budapest, Hungary and ends in Paris, the City of Light. It takes you down the Rhine, the Danube, the Main and Mosel rivers through six different countries: Hungary, Slovakia, Austria, Germany, Luxembourg and France. Included are stops in grand capitals like Budapest, Hungary, Vienna Austria and you’ll see some of the steepest vineyards in the world. Another option is to stick to one lovely country-France. You can’t go wrong here, more than 75 million tourists a year visit this fantastic country. There is a Viking River cruise that will take you from Paris out to Normandy, en route you’ll see Giverny, where Claude Monet once lived. Also on Seine is the city of Rouen, home of the France’s oldest restaurant where Julia Child first learned to cook. Then to the Normandy beaches that always bring out the patriotic side of Americans, especially when you gaze on the vast American Military Cemetery and have a look at the beaches where D-Day happened. I always want to spend my time in Rhine river cruises in Europe but the problem is I got my hectic schedule in my job so I just been watching for videos and pictures to satisfy my curiousness on it. Well, this summer I’ll be spending my time as well as finding someone to live with 🙂 Its about time you know.